http://www.PatriotSubaruofNA.com 774-203-4500 You do not have to compromise when buying a new car. The 2017 Subaru Crosstrek is designed to fit you and your lifestyle. It comes ready with Air Conditioning, 4 Way Adjustable Passenger's Seat, Keyless Entry System and Front and Rear Stabilizer Bar. Subaru gives you peace of mind with safety features in the Crosstrek like Daytime Running Lights, Rollover Sensor, Brake Override System and Rear Center 3-Point Belt. Everyone is unique, that is why the 2017 Crosstrek comes with so many optional features like Steering Responsive Fog Lights, Auto-Dimming Mirror with Compass and Trailer Hitch. For the all new Subaru line of vehicles near the Pawtucket, RI area, come to Patriot Subaru of North Attleboro in North Attleboro, MA. 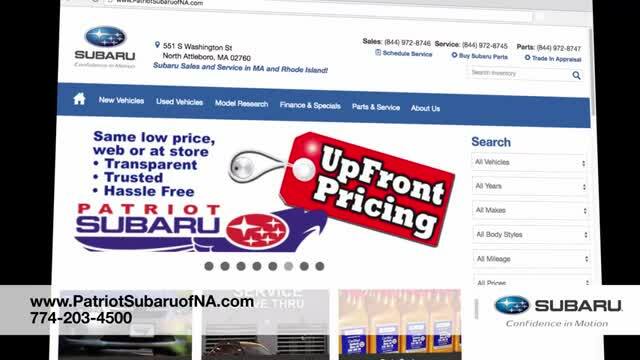 Call 774-203-4500 to schedule an appointment or visit http://www.PatriotSubaruofNA.com to see our great inventory online. We serve Rhode Island, RI and Providence, RI at 551 S. Washington St. North Attleboro, MA 02760. *Please check Subaru's manufacturer website for complete details and disclosures.